Scotland is a magical place. The green is greener, the sheep are fatter, the accents are more charming, and the coast is more mesmerizing than anywhere else. And if you're there in the summer, in the Highlands, the days go on and on, washed in the gentle northern light. I took this photograph late at night, at maybe 10 or 11 o'clock, and the light was still shining on the loch and the sea beyond. For a night owl, this is the perfect place to be. You don't have to worry about getting out a little late and missing the sunset. You just go out with your camera and stay as late as you want. If you imagine how wonderful these smells are — fresh rain on a summer day, apple pie cooking in the oven, a good curry, a baby's skin — and multiply them by ten, that's how delicious the scent of an English rose. From the lovely Digitalis comes a medicine and a poison. I photographed this foxglove in Scotland, its native territory, where the plant has long been used in folk medicine. But the aspect I find charming about the foxglove, besides its wonderful name, is that the flower is said to be a favorite home of "Faeries." If you plant them in your yard, you will attract butterflies, bees and the wee folk, according to legend. My daughter is a composer and she talks about the math in music, and sometimes I think about the math in flowers, too: the numbers of leaves and petals, the patterns, the symmetry. When you look closely at foxgloves, study their design — their architecture is amazing. I've been fascinated by Africa since I was 10, when I started looking at "National Geographic" magazines my fifth grade teacher kept in our classroom. Finally, at 53, I traveled to Tanzania and Kenya, not as a physician or teacher, as I'd imagined I would be earlier in life, but as a photographer. And after all the years of wondering what it would really be like, the Africa I saw overwhelmed me. My memory of this photograph: We left the temporary tented camp just as daylight began to break, and our driver navigated through thick fog and across rough, rutted roads to the crater. Maasai people in their blue or red clothing appeared suddenly as we drew very close — walking to their pastures, or maybe to a crossroads where they might find a ride to a village — and then disappeared into the fog. When we arrived at the crater, our vehicle followed the winding road on a 600-meter descent to the bottom of the caldera. The fog had lifted from the ground, but lingered in the air, obscuring the crater walls. We spotted a majestic elephant walking alone, illuminated by the morning light, one of its long tusks broken. He was grand, solemn, breathtaking. Elephants are incredible animals with complex family relationships and language. And even though they look sturdy and strong, their species is in peril. Imagining a world without elephants breaks my heart, and I know humans will be diminished if we allow elephants to disappear. The ancestors of the great-headed woolly bison migrated to America more than a half million years ago. But after overhunting in the 1800s, just more than 500 bison were left. The bison's story is a modern American success story, though, because their population has grown to 150,000. One of my favorite things about visiting Yellowstone National Park is watching bison hanging out by the rivers: bulls and cows and calves, tremendous herds. When I see them lumbering across the Lamar Valley, I feel like I've gone back in time. And when I drive across the West, I look out at the valleys and imagine bison there, wallowing in the dirt, thundering around en masse, kings of the plains. The bison is the largest American land animal, and while they seem to plod along with their colossal heads hanging down, they are fierce, and can move with lightning speed. I once saw bison bulls defending their herd against wolves, and I felt sorry for the wolves. When I photograph bison, I use a nice long lens because I value my life. And they often seem to look right back at me, and I feel a spiritual, eerie connection. Yellowstone is being loved to death by all of us. More than 4.25 million people visited the park during 2016. And while it's wonderful for people to be outdoors enjoying nature's wonders, you have to stop and think about the impact on the land and animals by that many people. Maybe visitors who are able should be allowed to enter the park only on foot. Maybe a quota/lottery system needs to be enacted. It's an amazing place, and it's important to treat it with reverence. Geysers are the most incredible wonders of nature, and it's always exciting when they erupt, even if you've seen it happen dozens of times. I first saw Old Faithful erupt in 1974. My family had driven from Texas on a tour of the American West in a tiny Ford Maverick, with my grandmother in the backseat between my brother and me. I was almost 13 and my brother was 11, and we all were terrified one afternoon when we lost my brother for a while in a Yellowstone campground. But I also remember my first time seeing Old Faithful, and wanting to wait and watch it erupt again. When I traveled back to Yellowstone with my daughter, I was just as captivated by the geysers as I had been years before, and very interested in looking at them through my camera. The water and light make magical combinations, so even though some things in Yellowstone have been photographed millions of times, they always look different. Quinta da Regaleira in Sintra, Portugal, is a palace and park built by Antonio Augusto Carvalho Monteiro around the turn of the last century. And even though I'm not superstitious, while walking through the gardens I felt it was a mystical place, with strange statues and carvings at every turn. And the flowers were phenomenal, particularly the hydrangeas, which grew like walls along the pathways. My grandmother grew hydrangeas around the pine trees in her yard in Louisiana. They were pretty and delicate, with pink and blue blossoms the size of your hand. They were one of my mother's favorite flowers. I was thinking about her when I took this photograph. While wandering those gardens, I came upon this seemingly forgotten greenhouse. Looking through a broken window, I saw pots overturned and piles of potting soil on the working surfaces, and it was as if this had been a pretty and well-used working greenhouse that suddenly had been abandoned, leaving projects only partly done. But on this day, the sun beamed through the glass and the neglected greenhouse looked like a little cathedral: quiet, mysterious, shimmering. Have you ever noticed that perfect things are kind of boring? Mistakes, wrinkles, flaws — they give people and places character, personality, mystery. This window wouldn't be interesting if it were perfect and new. But it's broken and old, so you wonder about its story – its journey — and it becomes more beautiful. I spotted this little altar built into the side of a building in Portugal, almost at street level. I don't know what it is. What is the little door with a lock, and who holds the key? Is this a crypt of some kind, or a memorial, or maybe a message box? Maybe I will go back someday and try to find the answer. I came upon this Madonna and child in the small, medieval village of Venasque, France. Nestled in a small alcove built into a wall outside a home, the Madonna is blue and made of pottery. I think she likes it there, under the olive tree. I lived for several years in the mountains of western Colorado, surrounded by quaking aspens. They are wondrous trees, tall and stately, rustling in the slightest wind and glowing golden every autumn. Sometimes while hiking in the wilderness areas we came upon old stands of aspens, with giant, white trunks, and ferns covering the forest floor between them. In truth, the aspen trees themselves might not be more than a hundred years old. But the fascinating thing about aspens is that the trees in a grove might be one organism, and that organism might be thousands of years old, with individual trees, all clones, growing and dying as the organism lives on underground. 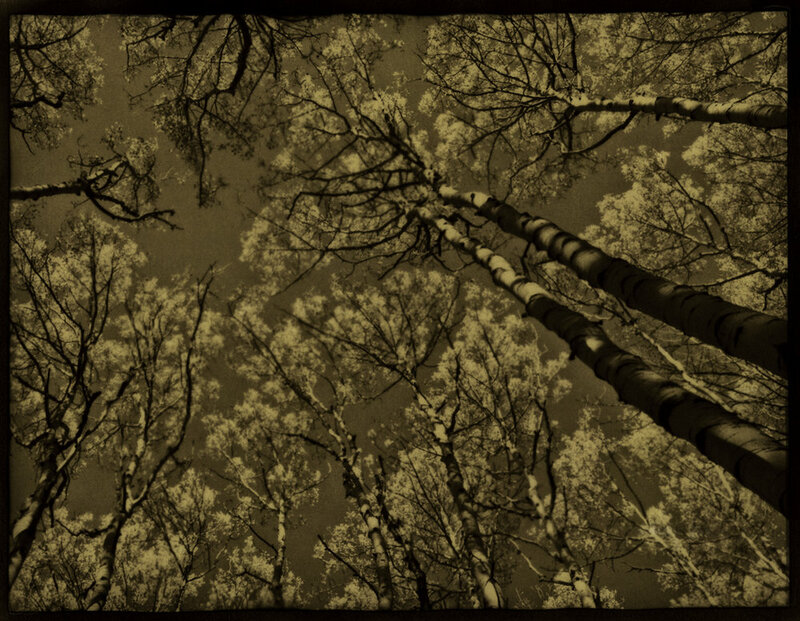 Pando, an aspen grove in Utah, is estimated to be 80,000 years old. While I was out walking one cold winter morning in the Texas Hill Country, I saw this prickly pear cactus rimmed with frost. I love the juxtaposition of ice with a plant that's symbolic of the desert. Big Bend National Park is one of my favorite places in the world. One, if you live in Texas, you have to drive to the Big Bend area to find mountains. Second, the Chisos Basin is one of the (in terms of temperature and otherwise) coolest places in the state, and sometimes, if you live in the South, you just have to drive and drive until you find cool, fresh air. Third, Big Bend is strangely beautiful. When you're driving to Big Bend, you go and go and go across a desert landscape. Flat. Scrubby. Lonesome. Then, all of a sudden, you see mountains, and you go there. Once inside the park and out on the hiking trail, nature comes to life and you see all manner of plants and animals and rock formations. I was hiking with old friends when we came upon this flower with a caterpillar perfectly curved around its center. Sometimes when I'm working in the darkroom, I think about how much close attention I'm paying to something like this caterpillar, long gone by now, and about how other people might look at the image one day, too. Photographing something makes it live on.